Yonkers Raceway’s the George Morton Levy Memorial and Blue Chip Matchmaker pacing series continue with round three Friday and Saturday. The ‘Levy’ and Matchmaker divisions have been strong for crowd choices and certainly the dual wins by former title-holder Foiled Again are not offering player profit but sweeps in the series are traditionally rare, so we will hoist the flag for some serious contenders that will pay in spades should any win. At the Meadowlands on Friday and Saturday, since we do not have any other major events to cover, we will engage in some exotics and offer contenders in difficult multi-exotics. And of course, the horses to watch (H2W), presented exclusively for TwinSpires harness blog, carries on its productive parade of contenders that usually offer a bounty of across-the-board prices and serve as profitable members of exotics. Yonkers Raceway’s Saturday, April 5 program, features four third-round divisions of Levys for the older male pacers. There is still a lot of action to go in these four-turn battles. The first division sends only six to post, two of which are Ron Burke trainees that did not fire yet. In round one we took a shot with Texican N but against Foiled Again he paced poorly. Last week, however, he was third to Foiled Again, sent off at 87-1. He won’t be in that territory this round but Foiled Again is not among the Burke brigade in this field. So, Texican N has a great chance and should be a value wager against this Burke duo and the two winless foes inside of him. The second Levy division is also a sextet, with Arachache Hanover looking for his first win of the season. So, however, is Malak Uswaad N, who we had in round one and came second at 14-1. Beware, too, of Sapphire City. She made big gains last week with an 8-length rally to three-quarters at 23-1. Both of these stand chances to topple the obvious Bettor’s Edge if “Arachache” challenges his rail journey (a very possible scenario). The third division has seven foes with another successful duo from Burke and the two-time surprise of the series, Mach It So and Apprentice Hanover. There is little room for a am upset here unless it is reflected in the way the public wages. Apprentice Hanover may be higher odds this week than “Mach,” as the public tries to make back what it lost on him. So look for a wager if “AH” winds up a third choice here. The final Levy episode of the night is either another theater for Foiled Again fans (how can we bet him at his prohibitive odds, even if you feel he has all the percentage points?) or another is a stream of what could be the best night to bet Levy for price? From post 7, Foiled needs another monster mile but will that be compromised by PH Supercam, the second highest money-earner this season, from post 1? It’s your call to back Versado (five seconds, poised to blow out) and Bet On The Law (one for two, fresh and raring to make an impression in the series). The third preliminary of the Matchmaker series commences Friday with only a trio of splits. The second division also appears worth the support of an outsider whose race last week was impressive, though it failed to produce an upset. Feeling You dueled early with the dominant Somwherovrarainbow and that cost her a spot on the board, if not the win. She was 15-1 then and does not have to deal with “…rainbow” here. Krispy Apple may get more support than last week when as the favorite she was unable to catch 4-1 Ideal In Vegas—and she should have done that. Charisma Hanover deals with post 7 here which may mean nothing but it could also mean a step that puts her behind Feeling You, which is what we will want to happen. Division three may see Anndrovette from post 8 in a battle to dominate the lead with the “now” horse, Ideal In Vegas. That could cost them both the race, with others eyeing the lead adding up to a three-quarters time that can allow Uf Dragon’s Queen to take to her full advantage and sweep through at a price. 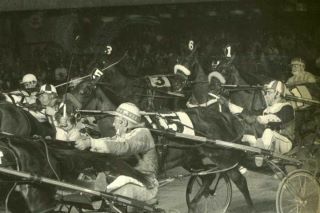 Last week “Queen” gained 5 lengths from the half to three-quarters before fading behind Angels Delight (not here tonight), who beat Anndrovette and Charisma Hanover. We won’t get verbose with our choices for Meadowlands Early Pick 4 (April 4), which entails a Pick 3, we will simply list the horses you may wish to add to your tickets. Handicapped well before there is even a morning line, no less the wagering itself, we are estimating horses that may offer prices with value (not to be confused with raw longshots). These horses to not appear on the H2W list below but we encourage them to be looked upon as strong across-the-board contenders aside from their worthy additions in the multi-exotics, as listed above. Non-winners will be added to H2W next week. It is good to know about horse riding it is very useful which I was looking for horse riding related posts please post more related blogs as this. After I have read about best-essay-writing.services this I found an interest to peruse it is compulsory for everyone now days.